The members of Genoa Club Amsterdam have chosen Domenico Criscito as Genoa Club Amsterdam Genoano of the year. Mimmo is a great player in the field with Genoa and the Italian National team but also outside the white lines he is a real gentlemen. Last year he overhanded the trophies at the United in the name of Genoa calcetto-tournament, tomorrow we give him a trophy in Siena. Congratulations Mimmo, also for the penalty in the last second of the match against Palermo. Every team in every league has an off-day a few times in a season. Our Genoa played such a bad match yesterday in Florence. The first shot of Genoa on the goal of keeper Frey arrived in the 60th minute which is incredible to a team that scored 5 times last week. After only 4 minutes Fiorentina already took the lead with a goal of Santana. Till halftime Genoa resisted but in the 2nd half also the second (dubious penalty of Gilardino) and the third goal arrived: 3-0. Besides the defeat Genoa also “lost” Sokratis and Juric to play Wednesday against Palermo in Luigi Ferraris. Both players received a yellow card. On the other hand captain Marco Rossi returns Wednesday after his suspension against Fiorentina. Our wingstriker Bosko Jankovic is operated again this week in Barcelona after he played only 15 minutes this season against Inter 2 weeks ago. The international of Serbia can not play for another 6 months, so he also can not play at the World Cup in South Africa. After the 3-4 defeat against Bologna 2 weeks ago again a fantastic spectacular game in Luigi Ferraris. This time also with our team as winner. Genoa played without a central forward because both Acquafresca and Suazo were injured, so the 3 wingstrikers: Palacio, Sculli and Palladino formed the attack. After Genoa hit twice the post and once the crossbar, Cagliari had opened the score with an irregular goal because the ball first was out of the field before Dessena scored, finally in the 36th minute our first goal arrived. It was Alberto Zapater who scored the penalty after Palacio was fouled. Within 8 minutes Genoa scored another 3 times by Palacio, Sculli and Rossi while also Conti of Cagliari scored, so the score at halftime was 4-2. In the second half Cagliari opened the score again by a penalty of Matri after a foul of Bocchetti. Only 5 minutes later Omar Milanetto decided the match by realizing a great assist of Palacio: 5-3. Genoa is now 7th in the standings with 42 points, so we are back in the Europa League-zone. Saturday we play at 18.00 hours in Florence. Just as last season Inter could not beat Genoa in their own Giuseppe Meazza stadium. Last year it was Thiago Motta who stopped Zlatan Ibrahimovic c.s., yesterday it was the complete defence of Genoa that stopped the Inter-strikers: Milito, Balotelli, Pandev, Eto’o and Quaresma. Mr. Gasperini started in the usual 3-4-3 system with Bocchetti in stead of the injured Dainelli and Mesto + Sculli as wingstrikers to support Suazo. Of course Inter was the strongest team in the field, but Marco Amelia was unemployed in the 1st half. After the break Inter played more agressive and more offensive, but the Genoa-defence was very strong. Inter-coach Mourinho was squalified but tried to help his team in the last 20 minutes from the 1st row in the mainstand. 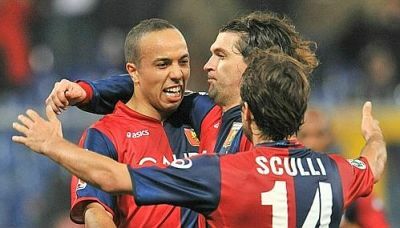 He also brought extra strikers in the field with Eto’o and Quaresma, but nothing succeeded to break the Genoa-defence. On the other side Mr. Gasperini changed Suazo with Jankovic, but our striker already had to leave the pitch again within 10 minutes with a new injury. 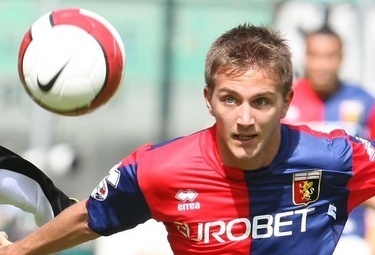 Despite the problems of Jankovic Genoa kept strong and took 1 point back home: 0-0.